Just finished a new lesson plan introducing circular motion. Enjoy! I can’t believe I haven’t posted on this topic yet! Rhett, from Dot Physics has a great explanation and videos, so there’s no need for me to reinvent the wheel. It’s super easy, so try it yourself! I LOVE this physics blog I found a few weeks ago! Dot Physics explores all sorts of cool physical situations and describes them using equations and really neat software. One recent post analyzed a guy running up a wall and doing a flip – see it here! My favorite post so far is written specifically for students who are about to take their first Physics course. The author does a great job addressing the fears introductory students have as well as giving tips to enjoy and succeed in physics class! In my Concepts in Physics course the other day at TC, we discusses race cars on a banked turn. We used free body diagrams (FBD) to illustrate where the centripetal force (the force that keeps the race car traveling in a circle). Here is the basic FBD for a car on a banked turn. The dot in the middle of the rectangle (car) represents the car’s motion out of the page and toward the drawer or looker. So, we’ve got the car on the incline. 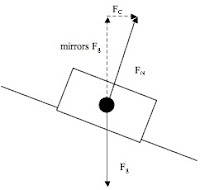 The force of gravity is always directly down — in the direction of a free hanging plumb line. 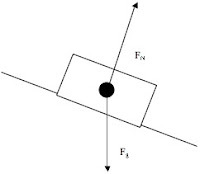 The normal force (typically the force opposite the gravitational force) is always perpendicular to the surface, so not vertical in this case. Now things start to get fun!!!! We draw the components of the normal force in with dotted lines; pretty much, we’re making the normal force the hypotenuse of a triangle. You can clearly see the vertical leg of the triangle is equal and opposite to the gravitational force. Left over is the little bit of horizontal normal force. Notice that it is pointing towards the center of the circle…it seeks the center. The definition for centripetal force is “center seeking”, so this must be the centripetal force on the car!!!! I thought this was a great demonstration to show students where this mysterious and confusing force comes from. It certainly isn’t magic!!! Start with a circle with the velocities pointing in the tangential direction to the circle. Draw the radius so students can see the velocity is perpendicular to the radius. Label the angles and radius so students can see they are the same (even if one angle is larger, it means the arc covered in that time is longer). The next step in the proof is some vector addition. Placing two vectors together (not using the initial vector since it has no vertical component), students can find the direction and magnitude of the acceleration. 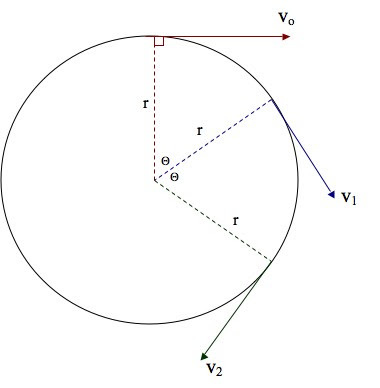 According to the image below, the acceleration will be toward the center of the circle. This triangle (when drawn well) will be a similar triangle to those in the circle. This means we can create a ratio. The arc(ab) can be written as the velocity multiplied by the change in time – the circle image. Therefore, the first part of the ratio can be written as v*(delta)t/r. 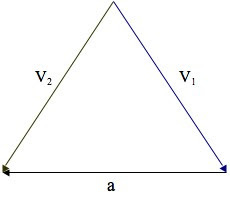 The triangle diagram shows the change in velocity divided by the magnitude of the velocity is analogous to the first part. Now we want to get the deltas on the same side. But, this is only an approximation, so we’ve got to figure out how to make it exact. Well, as the angle between the vectors approaches zero (again referring to the circle diagram), the arc(ab) approaches a straight line. And as the change in time approaches zero (as measurements become more instantaneous), the velocity becomes perpendicular to the acceleration. This means the approximation we made can be exact – both the velocity and radius are perpendicular to the acceleration. This isn’t the most clearly written proof, but I’ll work on it. – As velocity increases, so does acceleration. – As the radius increases, the acceleration decreases.